HSC/Uni Students - Feeling Stressed? Sutherland Library is providing an opportunity for students to reduce their stress prior the beginning of exams. We are offering a series of body balance classes for free on 9, 10 and 11 October. Take a short break from your study and come along to a Body Balance class, a combination of tai chi, pilates and yoga that helps reduce stress and improves balance and flexibility. The classes will be held at 12.30pm on Monday 9 October, Tuesday 10 October and Wednesday 11 October in the meeting room at Sutherland Library. The classes are 55 minutes long and will be run by qualified instructors from the Sutherland Leisure Centre. The classes are free but places are limited. Bookings are being taken on the day so you must ask at the Children's Enquiry Desk on the ground floor on the morning of the class to secure your place. Just another reason to enrol in one of our upcoming Internet Training courses. 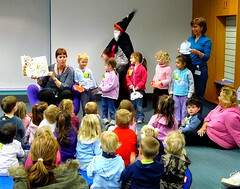 You can see more photos of kids enjoying The Magic Hat by Mem Fox at Sutherland Library on our flickr page. This book was read to children in libraries and schools throughout Australia as part of the National Simultaneous Storytime, a program that encourages reading and literacy in children. Strange but True, Libraries Help Deter Thieves! Did you know that you can borrow Engraving Kits from all Sutherland Shire Libraries? Engraving property with clearly identifiable marks, such as a drivers licence number is an effective deterrence for thieves. Property that is engraved is harder for thieves to dispose of, and is more likely to be recovered by police in the event that it is stolen. 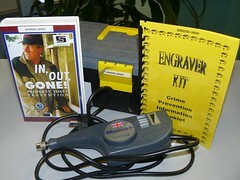 Secure your property and ask about our engraver kits on your next visit. Last May, as part of our Library Week celebrations, we invited you to unwrap selected new books. Well, now that Spring has arrived, we thought that it would be a good time to do it all again! Between Monday 17th September and Saturday the 22nd of September our branch libraries will be unwrapping a selection of new books - new authors, new recipes, new adventures! Celebrate the beginning of the warmer weather by coming in and grabbing a brand new book for yourself. Who knows what we will have? We may even have a book by one of your favourite authors! See you there! Do you remember the rest of this rhyme? Do you remember any other rhymes from your childhood? Do you take care of a baby or toddler? Rhymes are an easy and portable way to entertain your child – they can be sung in the car on a long trip, in a waiting room or they can become part of a morning or evening ritual – basically, anywhere, anytime! Best of all, you are doing something good for your child – the repetition and rhythm of childhood rhymes help lay the foundation for childhood literacy. At Menai Library we have just the program for you. Rhymetime is a drop-in activity held every Wednesday afternoon at 2pm (except during school holidays). It is conducted by a trained staff member and is absolutely FREE. Each week we have great fun with rhymes, songs, puppets and simple board books. So, if you have a little one that keeps you company drop into Menai Library, make some friends and make books and libraries part of your child’s life – they’ll love you for it! 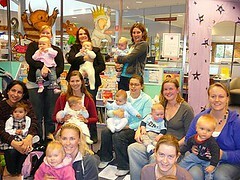 Rhymetime is held throughout the Shire – You can find all the details on our Rhymetime page.